Travka is a Romanian alternative rock band, its last line-up consisting of George Gâdei (vocals), Alexei Turcan (guitar, accordion, samples), Misha Gâlcă (guitar), Mizdan (bass) and Cristi Chirodea (drums). Founded in spring 2002 in the city of Focşani, Romania, the band quickly rises to fame in underground circles. 2003 is the year when Travka steps into spotlight, having various TV appearances and playing in front of thousands of people at music festivals such as Top T - Buzău and Stufstock. Recording of their debut, Corabia Nebunilor (Madmen’s Ship), begins in winter 2004, with a video being shot for the eponymous track. In summer 2005, however, George suffers a severe car accident and the band is put on hold for several months. Following his recovery, Travka’s debut album is finally released in December, gathering very positive reviews. The band continues playing various gigs and festivals around the country, attracting more and more fans with their eccentric approach and often cryptic lyrics, quickly becoming a household name in Romanian rock music. It is not, however, until 2007 that the band records and, later that year, releases their sophomore album: Vreau sa simt Praga (I Want to Feel Prague). This release causes quite a stir in the media, being the first Romanian album freely available over the Internet under a Creative Commons license. 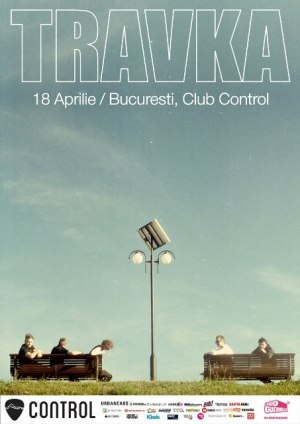 "TRAVKA Live" Concert in Bucharest. You can get here description, reviews, address, time and details of "TRAVKA Live" Concert in Bucharest. Visit Bucharest Tips for more Concert events in Bucharest!